If Jean-Yves Bordier has brought back the taste for butter, he was first a cheesemonger, with talent to mature cheeses. Soft rind, hard rind, pressed rind, heated- or unheated pressed rind, veined or marbled, washed rind, flowered rind: do you speak the same language as your cheese seller? For a layman, cheese vocabulary can seem very mysterious. These terms describe the result of different manufacturing techniques used in the cheese making process. Each one transmits the gestures, know-how and love for the matter and the product. They are also the fruit of man’s history, their climatology, resources, and business traditions. What’s more, and the most important for us, is that each family of cheeses is the bearer of different promises for our eyes, our taste buds and our olfactory senses. Learning to decode the families of cheeses can therefore help us to choose and taste them better! The cheese making process depends on a succession of different steps which are common to all cheeses. Some steps may be longer or shorter and more or less complex. This leads to cheeses with a high level of humidity and therefore a short lifespan, or firmer cheeses with harder rinds able to be aged several months or even years. “Little Swisses,” yogurts, smooth or country fromage frais: these fresh cheeses come from a transformation of the milk into light curds: coagulation, draining, sometimes even molding and salting. The cheeses’ silky, melt-in-your-mouth texture is sought out and each has a high level of humidity requiring them to be consumed quickly. These cheeses are not aged and therefore have a sweet and slightly tart taste. This family is made up mainly of goat cheeses. Goats came to France in the 8th century when the Saracens invaded the south of the country and advanced north before being defeated at Poitiers. Since then, goat milk has been used in manufacturing both local and industrial cheeses, as it only takes a few goats—five or six suffice—to make a sufficient quantity of milk. On the other hand, not so long ago, goat cheese production was strictly seasonal—the animals’ lactation took place only in February and at the end of summer. Today, farmers have been able to adjust the breeding season over time and modify the goats’ natural rhythm of milk production. Goat cheese is produced in exactly the same way as cows’ milk cheeses and varies according to the type of rind: curdling (most often via renneting), molding and draining, salting and aging. 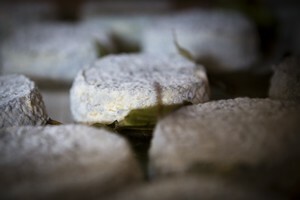 Most goat cheeses are soft rinds obtained without pressing the cheese. Many have a crust on which natural mold grows, and the same goat cheese may be enjoyed at different stages: curdled (0-8 days old), fresh (8-16 days), medium (between 2 weeks and 1 month) or dry (more than 1 month). Did you know? A goat only produces 3-4 liters of milk and over only 9 months of the year compared to about 20 liters per cow twice a year over 10 ½ months. 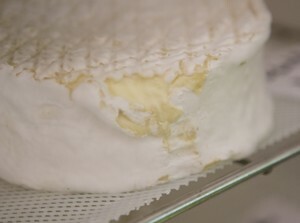 Camembert, Brie, Coulommiers, Brillat Savarin… The technique used is mixed curdling: a natural coagulation combined with renneting. The curd is then ladled out and placed delicately into molds to avoid breaking the curds. It is left to drain before turning the cheese over, removing it from the mold and salting it. Aging it in a ripening room begins in an atmosphere favorable to the development of a variety of white mold, penicillium camemberti which is sprayed on the outside. These cheeses are generally consumed between 1 and 2 months old. Maroilles, Livarot, Munster, Pont l’Evêque… These medieval (10th century) monks perfected this cheese making technique based on a specific aging process involving repeated washing of the crust. Cheeses in this family have less humidity than the previous one, making them less alterable and able to be aged for up to 6 months. The milk is heated, maturation begins and the rennet added. It coagulates and the curd is obtained. The curd is cut into large pieces and then stirred. In this way the lactoserum or whey can run off and be removed. The curd is then molded in bottomless molds laid on wooden planks. The molds are turned over several times a day to favor the draining off of the whey. Aging is then carried out in cool and very humid cellars. The cheese maturers regularly wash the cheeses all over with salt water either by hand or with a soft brush or a sponge. This operation accelerates the formation of the crust. In some regions, the salt water is replaced by one containing a regional liqueur: cider, beer, champagne liqueur, Burgundy wine liqueur, and so on. It usually takes two to three months to obtain a perfectly aged cheese. Roquefort, Auvergne or Gex blue, Montbrison Fourme, Stilton… Marbled or veined cheeses belong to one of the most ancient families of cheeses. The origin of these cheeses was lost in history. Roquefort was the first cheese to be protected by an official decree in July 1925. It is even said that Charlemagne himself enjoyed Roquefort. The quality of these cheeses is recognizable thanks to the density and regularity of the blue-green veins, which must be smooth, and the light yellow coloring of the cheese. Either cow’s or goat’s cheese, pasteurized or not, the milk is heated to 32°C (89.6°F) and curdles thanks to added fermentation. The curd is then left to drain naturally without kneading or dividing it. 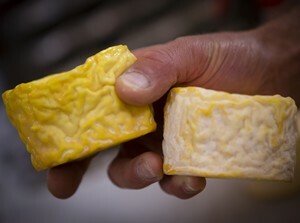 After it is drained, it is broken into small bits onto which the penicillium Roqueforti is sprinkled and placed into a cylindrical mold before being salted. It is placed into aging cellars in which the internal mold develops thanks to the air incorporated in the cheese via long needles. After a first maturation process in a ripening room, the cheeses are aged in cool and very humid cellars. 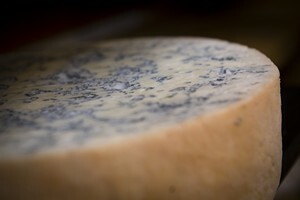 Proliferation of the blue mold is stopped by wrapping the cheese in a sheet of pewter. 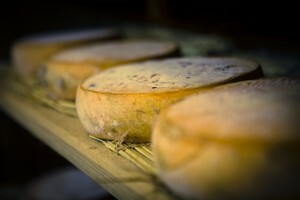 Aging veined cheeses lasts a minimum 4-6 months. It allows the rind to become smooth and develop all the aromas and flavors contained in the milk. St. Nectaire, ewe Pyrenees, Savoy Tomme, Lagiole, Cantal, Salers… The origin of these pressed, uncooked rinds goes back to the Middle Ages, when many monasteries were being founded all over Europe. The monks and nuns raised herds of cattle the value of whose milk was enhanced through cheese making. Thanks to the technique of pressing the rind, the monks were able to store these cheeses longer and eat them throughout the year. The milk used to make pressed, uncooked rind cheeses is either pasteurized or raw cow’s milk. It is first heated to 36°C (96.8°F) and then curdled quickly thanks to rennet. The curd is cut into very small pieces and stirred before being poured into large pieces of fabric called cheesecloth, then placed into molds before being weighted down to drain as quickly as possible. After this series of operations, the wheels are removed having taken their shape. If the salting of the mass did not take place before it was pressed, the cheeses are plunged into a brine for several hours, then rubbed with salt several times so that it penetrates and consolidates the outer crust. The cheeses are then placed in humid, cool cellars where there aromas and flavors develop. To finish, they are washed in salt water and turned over every day, and every day a bit less than the day before. Comté, Beaufort, Gruyère, Emmental: the mountain tradition of pressing cooked rinds makes for very large and very heavy wheels. The tradition comes from around the 13th century, at which time shepherds, who spent their summers in the high altitude pastures with their sheep, made cheese which would keep long enough for them to come back down again into the valleys. These cheeses are made with either raw or pasteurized milk, which in both cases is heated slightly to 32-34°C (89.6°-93.2°F) before being set to coagulate either with rennet or with a mixture of rennet and lactic ferment, an enzyme. Curdling must take place quickly, not going over 30-35 minutes. The curd is then mixed with a sharpened paddle and reduced to very small pieces the size of a grain of wheat. The cheese is then cooked: the curd is left in the vat where it was stirred and the temperatures raised to just over 50°C (122°F). This heating process makes for a much faster dehydration of the cheese. The curd, still moist, is gathered together in a large piece of cheesecloth to drain for a first time. It is then placed in a mold which is inserted into a mechanical press for several hours to drain as much as possible via pressure. Once this draining process finished, the cheese is then salted by successive brine baths over a week’s time. Then, it is rubbed several times again with salt to obtain a perfectly smooth and hard crust. Once the manufacturing process has finished, the wheels are transported to cellars where they can mature at room temperature allowing the fermentation enzymes to release CO2. As soon as the cheeses have reached their peak maturity, they are transported into much cooler aging cellars where they remain a minimum 3-6 months, sometimes up to 30 months. The wheels are constantly monitored and “cared for” thanks to many manipulations: washings, brushings and rubbings. Many times it will take up to a year before these cheeses slowly reach their target development of their rinds and their best fruity flavor. Did you know? 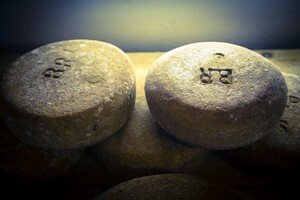 Pressed, cooked cheeses often required 100 liters (26 ½ gallons) of milk just to make one 10 kg (22 lb) wheel of cheese. How to Make Up a Cheese Tray?